Try these yummy little bundle of love treats are ONLY 35 Calories each! How amazing is that? I recommend you buy a good quality semi-sweet morsel that has at least 60% cocoa content. 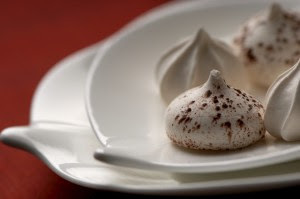 I love popping a couple of meringue crisps if I am experiencing a sugar craving. Try adding a couple drops of red food coloring to make them pink for Valentine’s Day. 2. Bake walnuts in a shallow baking sheet, stirring occasionally, 5 minutes or until toasted. Set aside. 3. Beat egg whites and vanilla at high speed with an electric mixer until eggs form a still peak. 4. Add Spenda® (sucralose) sugar blend, 1 T at a time, beating until stiff peaks form; stir in walnuts and chocolate chips. 5. Spoon rounded teaspoons of mixture on baking sheets lined with parchment paper. 6. Bake 15 minutes. Drop oven temperature on 200 degrees F. Bake for one hour and 45 minutes. Cool slightly on cookie sheet. Remove to wire racks to cool completely. Store in an airtight tin. Yields: 36. Serving size: 1 cookie. Nutritional content: 35 Calories, 1g fat, 1g saturated fat, 1g protein, 4g carbohydrates, 0mg sodium. *Note: You can easily make these diabetic cookies by deleting the chocolate morsels. For more great tasting, low Calorie Desserts, buy Linda’s SOUPer Slim Diet ebook @www.LindaLaRue.com/store.